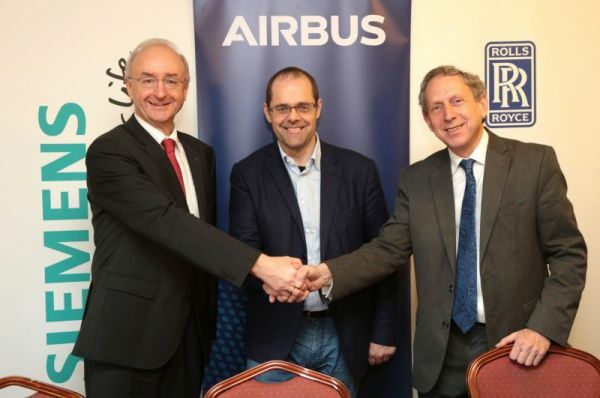 Hybrid is the new narrative at Airbus. The manufacturer joined forces with industry behemoths Rolls-Royce and Siemens in the EFAN-X project to study and trial a technology that might become the next big thing in commercial aviation. A race between engineers and time will decide, whether the next Airbus airliner will be a hybrid by design, according to Cousin. Mr. Cousin, could you guide us through the evolution ahead concerning the E-Fan X-Project please? Mark Cousin: The E-Fan X is a single demonstrator programme that we launched in London last year with our partners on the programme Rolls-Royce and Siemens. Our intention is to develop a hybrid electric aircraft where we replace one of the gas turbine engines with an engine to be able to work with an electric motor. Within the fuselage we have a Rolls-Royce gas turbine engine with an integrated generator generating power when needed. And we also have within the fuselage a large two megawatt-battery providing an alternative power source for the electric motor. This is what we call a serial hybrid system. This is not because we think this will be the first configuration of product, but it is the configuration which allows us to learn the most in our two year terms. Therefore the demonstrator is not intended to be a product as such, it is intended to be a vehicle for driving the development of certain critical technologies that are involved in hybrid electric propulsion that we know we will need for the future. Could you go a bit more into detail what the demonstrator will be like? Cousin: The demonstrator is built around three two megawatt elements, a two-megawatt-generator, a two-megawatt-battery and a two megawatt propulsion system. So the electric propulsion system will be a two-megawatt-motor coming from our partner Siemens driving a Fan assembly from an existing Rolls-Royce engine. It will generate thrust through the Fan assembly driven by the electric motor. That is what we call an electric propulsion unit. The battery will be housed in the fuselage of the aircraft. It will be by far the largest battery ever flown in an aircraft and we still have to develop this technology. And the third element of the unit is coming from our partner Rolls-Royce which is a gas turbine with an integrated generator. A generator which is partially integrated into the compressor of the gas turbine. This is where we see the hybrid technology of engines is going in the future. Rolls-Royce is developing this unit using the E-Fan X as a test bed. The main reason why we take care about a flight test is that there is a lot that we can do on ground, but there are also many things that we have to operate in flight. With these technologies how we prevent electric arcing and short circuit and how we safely manage the installation of a high voltage distribution systems within the airplane are key learnings that we expect to get from the E-Fan X demonstrator. What will be the size of the demonstrator? 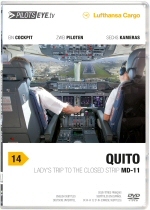 Cousin: The demonstrator will be based on the airframe of an RJ 100 aircraft which is a 100 seat aircraft. Maybe just to give an idea: the two megawatt-sized electric motor that we are producing is about the size of propulsion system that you would find on a 40-seat-turbopropper aircraft. Do these numbers already give an idea of the commercial perspectives of the E-Fan X cooperation with Siemens and Rolls-Royce - perhaps your intention is to build a hybrid aircraft for about 100 passengers? Cousin: Today we don’t have a mature product intention. Our objective is to develop hybrid electric technology which could be deployed on a smaller aircraft. But as you know today Airbus don’t produce Aircraft smaller than 150 seats. But it may also be deployed in what we call parallel hybrid systems where there is a generator in between the gas turbine and the Fan of the traditional gas turbine where there is an ability to extract or inject electric power depending on the phase of flight. Today we don’t know what the first product application will be. We are developing generic technology which could be applicable to many different sizes of aircraft including a potential future single aisle aircraft - but not providing pure electric propulsion, but as a parallel hybrid. Do you think that the CSeries might be a possible Platform for this technology? Cousin: The CSeries is still too big for a pure electric propulsion technology. 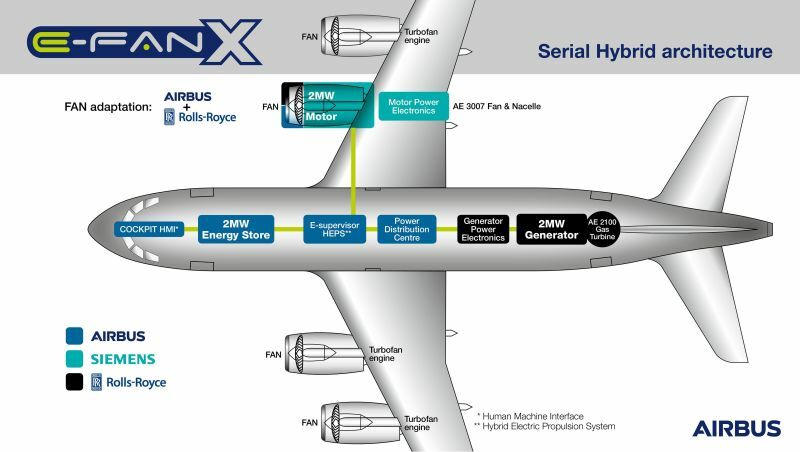 We don’t see pure electric propulsion on an A320 or a CSeries in the short term. But an intermediate step of hybridization of a traditional gas turbine. What you are saying is that the technology is not compatible with your current portfolio of aircraft? Cousin: We do strongly believe that by 2030 our single aisle aircraft will be hybrids. The technology is compatible in the sense that we will probably have energy storage, batteries, in the fuselage and we will have a motor integrated into the engine. We would not expect to see this pure serial hybrid architecture we are using on the E-Fan X on those airplanes, but we do expect to see a progression towards hybrid propulsion which is one of the next technologies which we see in reducing the fuel burn and the environmental impact of aircraft in the future. Thus, you are talking about adapting the new technology to current aircraft. But do you think it would also be possible that this technology triggers a change in the design of airframes? Cousin: Yes. I think when we progress to pure electric propulsion systems or serial electric propulsion systems like the one we are testing on the E-Fan X, it is certain that the airframes will look different from the ones we have today. Could you give us a time frame for larger aircraft using the hybrid technology operating in daily business? Cousin: Having hybrid electric propulsion in our single Aisle aircraft for example where we have an energy storage on board and a motor generator integrated into the gas turbine engine – in this case the configuration of the aircraft probably will not look that different from what it looks today. I would see this type of configuration being possible in the 2025 to 2030 - time scale. You think that the E-Fan X for example could evolve its full potential scale in an already existing aircraft – so you don’t need a new aircraft for this technology, the hybrids? Cousin: The technology we are developing on the E-Fan X is capable of bringing benefits in hybridisation even to existing aircraft but equipped with new engines and modifications to the systems and so on. So, yes, it is possible that we would see an evolution of current type of aircraft using the technology that we are using on the E-Fan X. "At some point probably in the next ten years we will launch a new generation of single aisle aircraft"
But might it also be that the technology brings even more benefit with a new aircraft for a hundred passengers for example? Cousin: Yes, for sure. When you design a new aircraft, you exploit more benefits from the new technology than if you are adapting it to an existing configuration. Do you think this is an option for Airbus in the near future? Cousin: It is certainly possible. I mean, at some point probably in the next ten years we will launch a new generation of single aisle aircraft. This hybrid technology may well be part of that new single aisle aircraft. We don’t know how today. We are in the early stages of developing and understanding the maturity level of the technology. How that technology might be integrated into and how much it might affect the next generation of aircraft depends to certain extent on how quickly this technology develops. Some of these technologies are developing exponentially well – they are doubling performance every couple of years. Then the opportunities to incorporate something very different into a new aircraft would be obviously much bigger than if they develop slowly. Boeing and Zunum Aerospace are working on a hybrid as well. Do you think that you are pursuing the same objectives like them? Cousin: Yes, I think we are developing the same technologies they will rely on for the Zunum concept. But we are taking a slightly different approach. At Airbus we haven’t yet committed to producing a small electric powered aircraft as they are talking about. We want to focus first on developing and maturing the technology and second understanding the market for that technology. Because sure it has attractive environmental impacts and economics but for the airlines those aircraft will have to be competitive in the economics to the aircraft we are using today. Mr. Cousin, thank you very much for the interview.